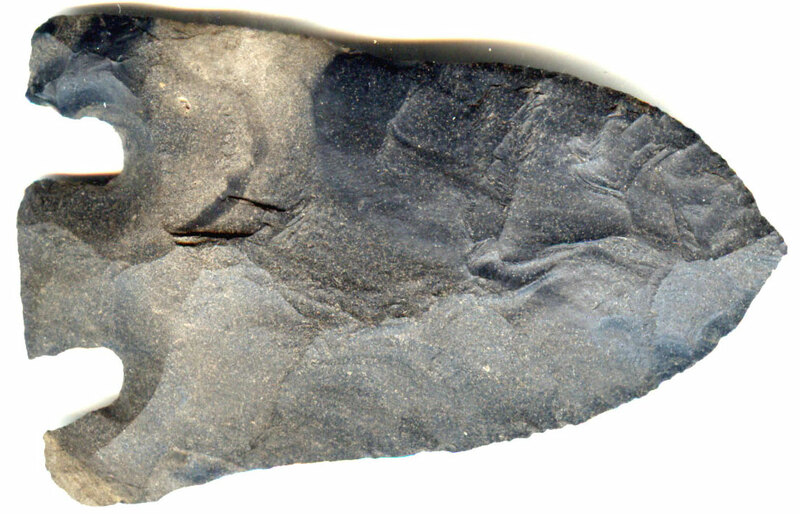 A Large Size, Colorful, Well Made And Nicely Flaked, Smith Point That Exhibits Surface Oxidation Aging And Overall Stone Patination, Correct Basal Style Notching And Squared Tangs, Aging In The Stem Notching, Consistent Aged Surface Deposits, Visible Aged Sharpening Use Reduction, Correct Material And Manufacture For The Area Found. This Example Is Made From A Cortex Chert Nodule With The Ability For The Maker To Thin The Tip Area For More Productive Cutting. The Location Of Find, The Basal Thickness, Type Of Stem, Shape Of Tangs And Style Of Notching Determine The Artifact Type. Includes A Ken Partain Certificate Of Authenticity.